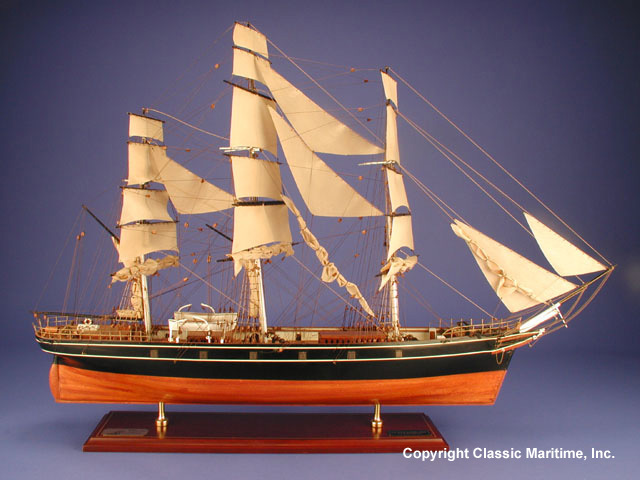 The Cutty Sark spent eight years in the sea trade making eight voyages to China. With the decline of clipper trade following the opening of the Suez Canal, Cutty Sark spent some years in general trade and was used to carry general cargo to Australia and raw wood on the return voyage to England—her fastest time being 69 days. In 1865 she was sold to a Portuguese owner and sailed under that flag for 27 years as the Ferreira and later the Maria do Amparo. She is now on display at the National Maritime Museum, Greenwich. Dimensions (L x W x H): 35.0" x 12.0" x 24.0"